Envision your college campus. Did you live in the dorms? Were there constantly extra curricular activities going on in addition to your everyday classes? I don’t know about your school, but at mine that is how it worked. If you weren’t in class, you were forming a study group with people in your classes. If you weren’t studying, you were participating in an intramural sport. Imagine going back to that life (minus the craziness of being in a foreign place in your foreign 20s). What was it like to have that constant collaboration? Would it be more fulfilling to live with a group of like-minded individuals? Coworking startup WeWork began testing its first residential offering in New York City called WeLive. 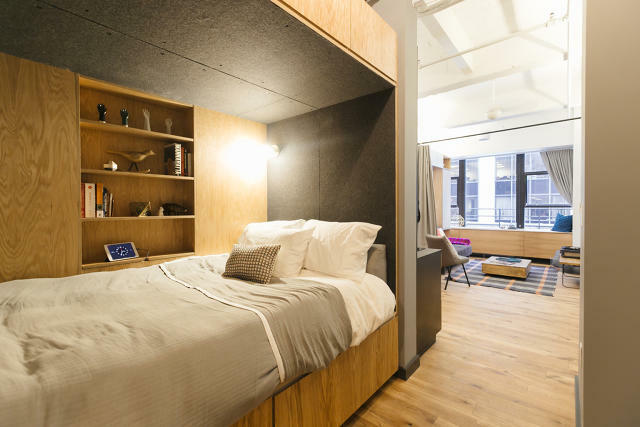 About 80 WeWork members and employees have moved into 45 apartment units in WeWork’s first "coliving" space at 110 Wall Street, which will eventually house about 600 people on 20 floors. Along with living accommodations, residents will have access to community events, like fitness classes, potluck dinners, services like cleaning and laundry, and a digital social network—all of which can be coordinated through a mobile app. An apartment at WeLive's space in New York City. "We are in the early stages of beta testing a new, community-driven living concept in New York City," a WeWork spokesperson told Fast Company. "This concept is another layer of our platform focused on enabling people to live more fulfilling lives. During this testing phase, we’ll be listening to feedback from our community." Although, WeLive is just in the beginning phases of experimentation, it will be interesting to see the results of the status of its members. Has their health and wellness improved since moving in? Has their productivity, efficiency, and creativity increased? These are all questions I am excited to learn the answers to as they continue their experiment and possibly expand. Would you participate in the experiment?